Imagine what you could do here. At Apple, new ideas have a way of becoming extraordinary products, services, and customer experiences very quickly. Bring your passion and dedication to the team and there's no telling what you could accomplish. Join the team that provides software security technologies to Apple. You’ll architect and develop core software that is incorporated in products and services across Apple. We’re looking for a disciplined, meticulous engineer to develop rock-solid code and work with other teams to get it integrated and launched to our customers. 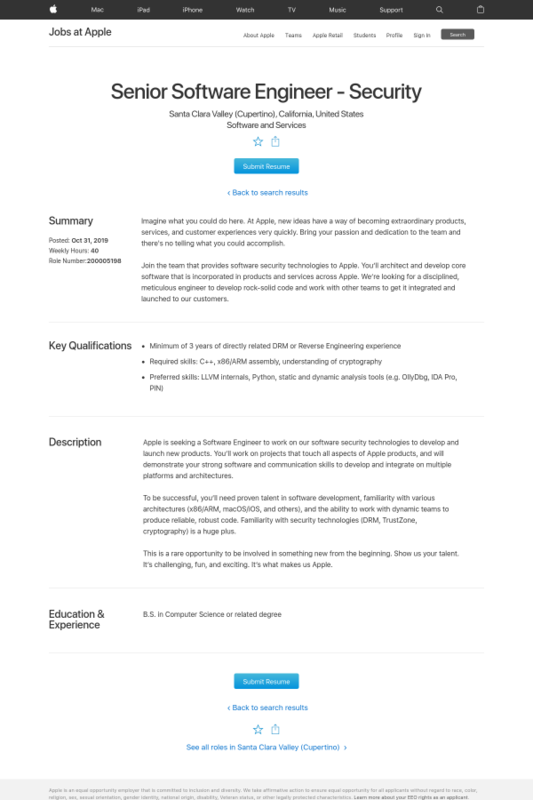 Apple is looking for a Software Engineer to work on our software security technologies. You’ll work on projects that touch all aspects of Apple products, and will demonstrate your strong software and communication skills to develop and integrate on multiple platforms and architectures. To be successful, you’ll need proven talent in software development, familiarity with various architectures (x86/ARM, macOS/iOS, and others), and the ability to work with dynamic teams to produce reliable, robust code. Familiarity with security technologies (DRM, cryptography) is a plus. Experience reverse engineering protected software — e.g. for IP extraction, red teaming, or malware analysis — is highly relevant. This is a critical position where you will innovate and drive the state-of-the-art software protection technology. It’s challenging, fun, and exciting. It’s what makes us Apple.